Support from the TB Vets Charitable Foundation will allow some Royal Columbian Hospital patients who face respiratory failure to avoid the need to be intubated. 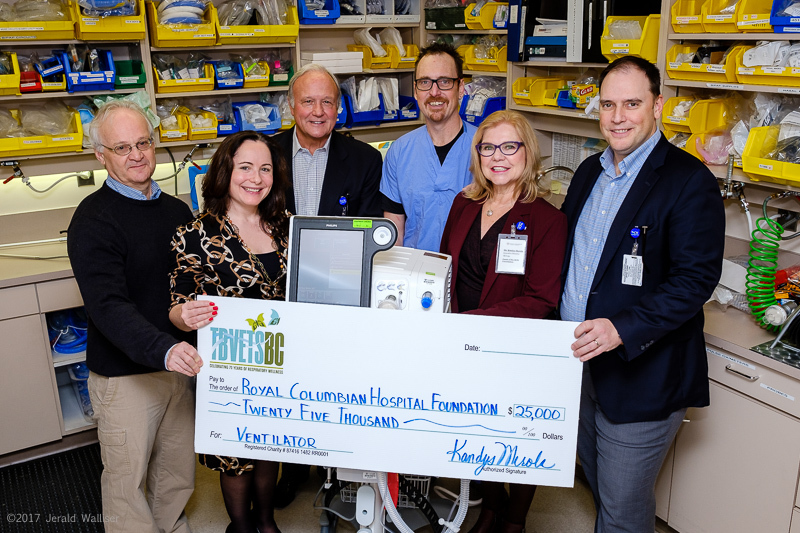 A $25,000 donation has helped to purchase a non-invasive ventilator that supports patients by using a face mask instead of intubation. The ventilator helps to avoid some of the risks associated with breathing tubes and allows patients to remain mobile and eat on their own. It’s the second similar system funded by the TB Vets for the hospital in the last two years. Frail, palliative and pediatric patients are among those that may benefit from this non-invasive ventilator. Photo: Dario Nonis (1st from left), Eric Beddis (3rd), and Kandys Merola (5th) from TB Vets are joined by the Foundation’s Catherine Cornish (2nd) and Jeff Norris (6th) as well as Respiratory Therapy Clinical Supervisor Jason Zurba.